Polenta is not an ingredient I grew up with. But somehow this slightly sweet and gritty coarsely ground maize is beginning to grow on me. It has slowly becoming my pantry staple and subconsciously reaching for the next packet in the supermarket whenever it ran out. What can I say, polenta and I have been busy in the kitchen ha! Together we had churned out delicious goods like crackers, muffins, galette, cake and baked potatoes. Before my first taste of polenta porridge at Factory Espresso (in Orange, NSW), I liked to hide polenta in baked goods. As the saying goes, “you have to love them for who they are”. So this is my way of cooking polenta as it should be – as a porridge. I like to use it as a substitute for oatmeal. As much as I enjoy some oaty goodness for breakfast, I enjoy to change things up from time to time too! So here’s, my breakfast polenta porridge cooked in coconut milk. Having said that, I diluted the coconut milk with water to ensure it is not too rich. Generally, I do not add any sweetener in the porridge but rather, a little sprinkle/drizzle at the end just before serving to ensure whomever I am serving has the choice to add the amount of sweetener to taste, or not at all. In a measuring jug, add coconut milk and top up with water to make 3 cups of liquid. Gently boil 2 cups of liquid over low-medium heat. When it is almost boiling, add polenta. Over very low heat (switch the smallest burner), keep stirring the polenta mixture over low heat. 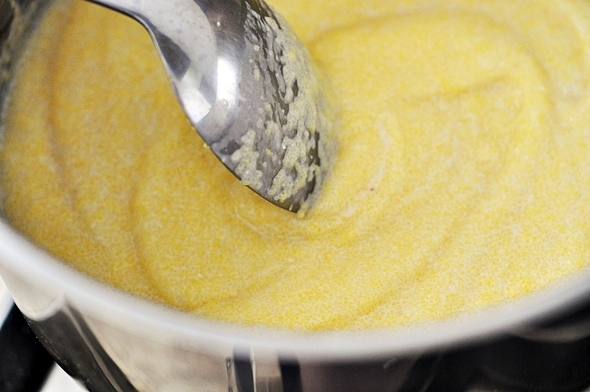 Keep stirring until the polenta mixture no longer feels grainy. You may need to add more water if it takes a little long for the the mixture to become not grainy and to achieve your desired consistency. 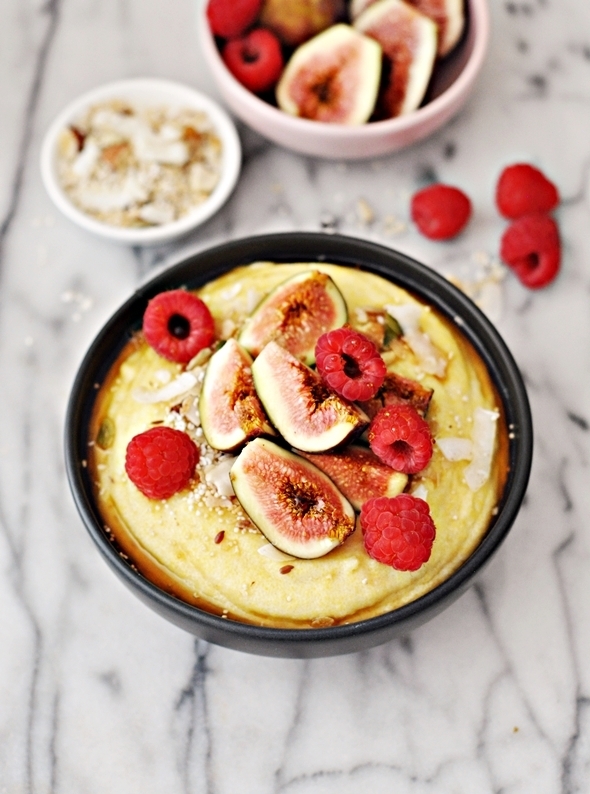 Transfer and divide the polenta porridge into two individual bowls. Top with granola, figs, raspberries and a drizzling of maple syrup. Serve immediately. 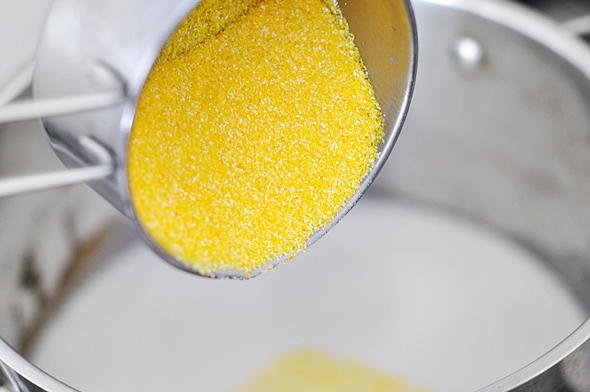 [Note 1] If you use instant polenta, follow the liquid to polenta ratio as specified by the packet instructions and scale up or down accordingly. I used the Macro Natural Polenta from Woolworths. [Note 2] I find it helps to add 2 tbsps of water just before finish cooking so that the porridge doesn’t become a really thick paste when it cools down a little. The choice of sweetener for this polenta porridge is obviously maple syrup. It’s a tad expensive choice of sweetener in Australia but the combination of coconut milk and maple syrup reminds me of home, like the coconut sago and palm sugar dessert I had in Malaysia. So my friends, what dessert reminds you of home? This looks beautiful, such gorgeous photos too. 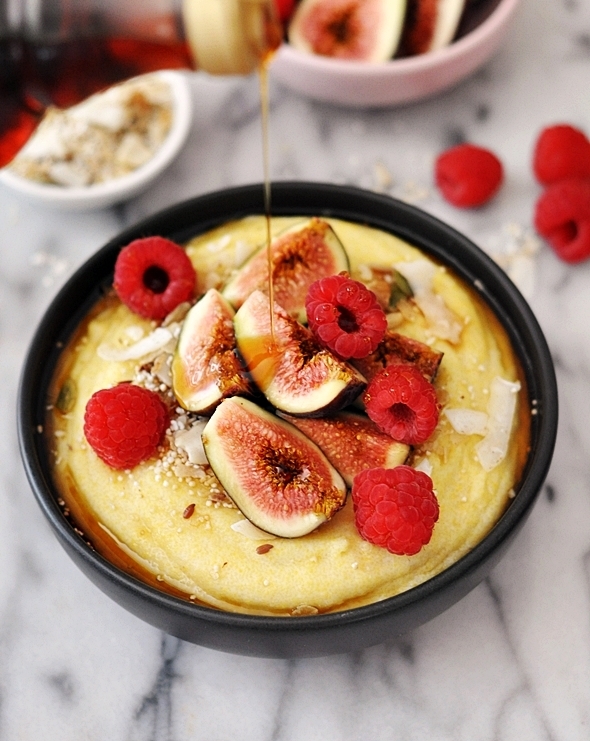 I’ve never tried sweet polenta, breakfast-style, but I’ve been using it a lot more in savoury dishes. It sounds like a gorgeous alternative to porridge. I LOVE polenta! This seems like a great way to mix up breakfast!